These are the actual milestones that you won’t read about in the baby books. 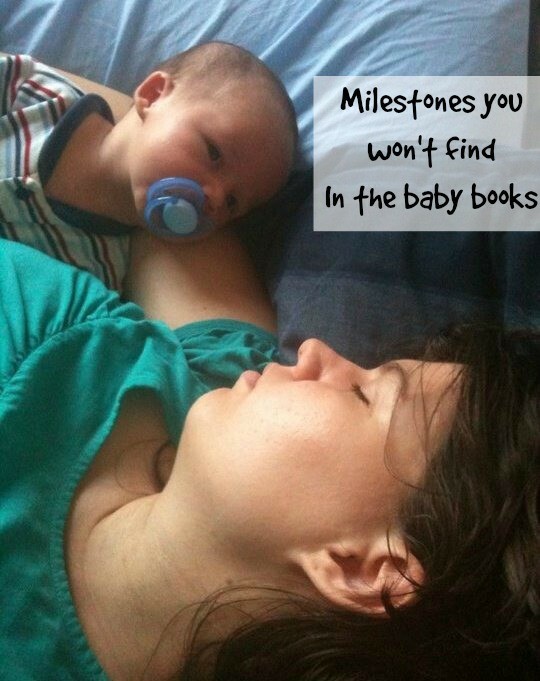 Have you ever noticed that baby books are filled with predictably adorable milestones for you and your baby? First tooth, sleeping through the night, return to pre-baby weight, first solid food, first word… The cute list of milestones goes on and on. This post has affiliate links. Those are fun and exciting, but let’s be real. 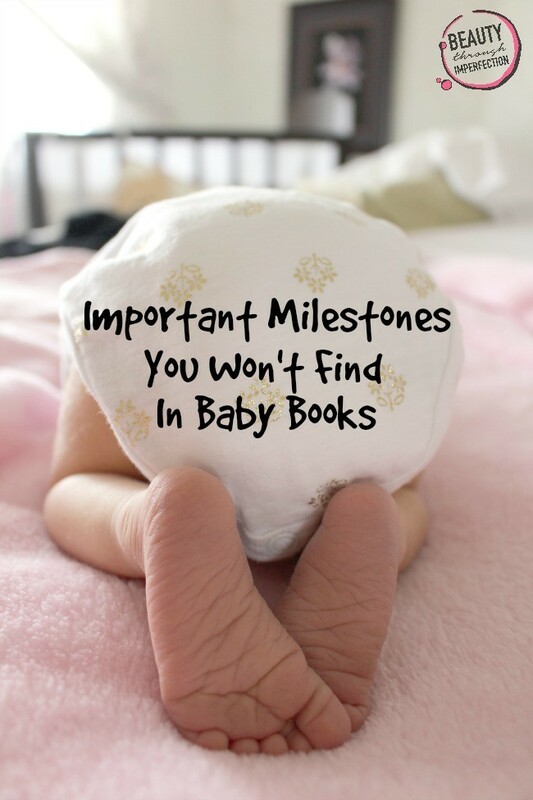 There’s a whole OTHER list of milestones that the baby books don’t tell you about. Here is a realistic mom’s guide to milestones and a list of “firsts” you won’t find in the baby books. The first time you get pooped on. Yep, I went there. Or, the baby did, rather. This is a huge milestone in the life of a new parent. 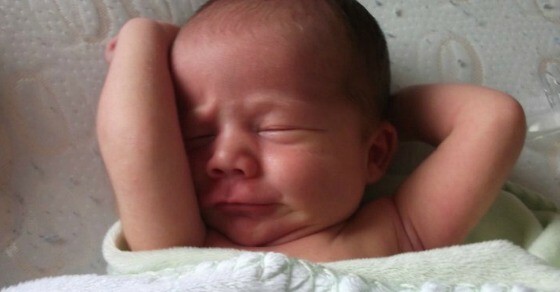 For some lucky moms and dads this happens just moments after seeing your precious cherub for the first time. Others of us have to wait a few years. But it’s coming whether you want it to or not. Every seasoned parent will tell you to “try to sleep when the baby sleeps”. Now, we all know this is impossible, but what you may not know is that there will come a time that you will cry when the baby cries. Maybe it’s the 57th middle of the night feeding in one 6 hour stretch. Perhaps it’s the first time you try the greatly debated “cry it out” sleep method. Regardless of the reason, we all have those moments where we feel personally responsible for every sweet little baby tear or the times when exhaustion completely overwhelms or hormones take over. Crying when your baby cries is not the most glorious of milestones, but it’s okay mama. You’ll get through, and you’ll still be a great mama even through your tears. There will come a time when you will look at all the other new moms around you and think they have it all together. Their babies always look adorable, they somehow manage to wear makeup, shower and not look like they’ve been up all night with a teething infant and they don’t seem the slightest bit stressed about all the things you can’t stop worrying about. You might wonder if there’s something wrong with you… I have a little mommy-secret for you though. You really aren’t missing anything. We are all just figuring it out as we go. There will always be a mom who looks like she knows more than you, one that seems to keep her cool better or others who always have the write answer. But the truth is, while they excel in those areas, they are most likely just winging it in the areas that you are rocking in. None of us have all the answers, and you are doing an awesome job, just like the rest of the moms who have no clue what they’re doing either. You may have been told these start at age two. Nope. Untrue. While the actual “toddler tantrums” start closer to 18 months, infants have their tantrums too. The best part is, they are incapable of even basic communication so it’s likely you won’t even know why they are tantruming. Fun times my friend, fun times. For me, this didn’t come right away, but some time between the tears, the clean ups, the giggles and the stress I realized I was doing a good job. I hope you find that day quicker than I did, because the truth is it’s harder to be a bad mom than it is to be a good one. We’ll all make mistakes. There will always be a day or two we’d like to re-do and our kids won’t think that we were perfect, but the will know we loved them, did our best and stressed way too much about the little things. Find beauty in today, in the midst of whatever sticky, crazy, tearfully beautiful milestone that you are facing. You are an amazing mom. Yes to all of this Paula! I still remember the day when I was so scared and embarrassed about what other moms thought of me (as I pushed my wailing baby in a stroller trying to remain calm and collected). And yep, I also remember when I cried right along with the baby. Major hormones, but also just overwhelmed with everything. My goodness, it’s sort of crazy thinking back to those days but yes, I wish I could tell myself how amazing I was doing. Wow, thanks so much for this. I am am foster mom to four beautiful girls ages 5, 3, 18 and 3 months old. And this is what I needed to read in this moment! 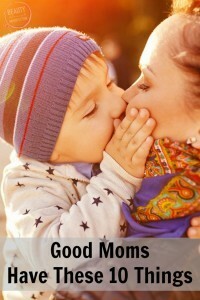 I often question if I am doing more harm than good because I did not become a mom in the traditional way. This post hits the nail on the head and I appreciate that I am not alone in my worries!!!! Yes on the taking off diaper!! My first child (now 2.5) went through a HORRIBLE phase of taking off her diaper and “painting” we had tried everything to stop it- putting a shirt on over her sleeper, using a safety pin, and one that worked for a while was cutting the feet off the sleeper and putting it on backwards! Once that was figured out we bought clips (like the kind in a highchair) and sewed them on the sleeper over the zipper. Those are impossible for her to get off! Luckily she seems to have just grown out of this (lasted almost a year) but I hope some of my suggestions may help another mom! Hi Paula! It’s a great article. Saw a tiny error. Thought of mentioning. There will always be a mom who looks like she knows more than you, one that seems to keep her cool better or others who always have the *write*answer. In love with this post!!!! Tears of laughter and a little sorrow over here by how spot on this is!! Way to go mama! What a trip down memory lane. I remember the days of NO sleep all too well. My baby had acid reflux and didn’t sleep well for the first few months. No baby book will train you for sleep derivation. Thanks Paula…there is nothing like having a seasoned mother to help a new mom get through hard times. 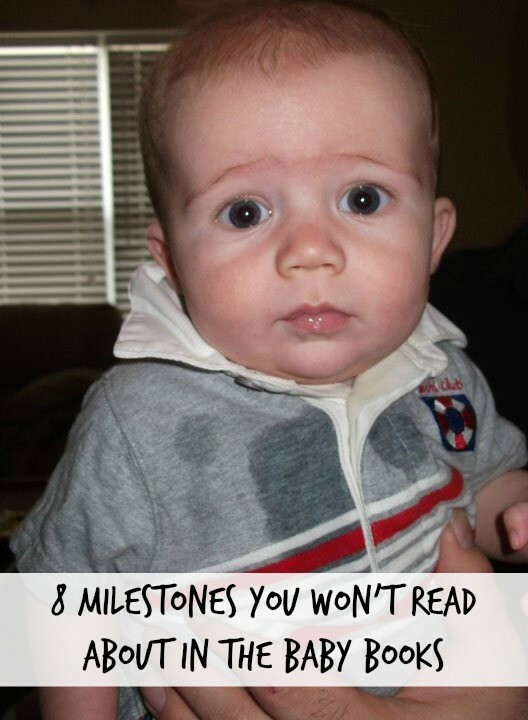 Hey Buddy!, I found this information for you: "Milestones You Won’t Read About In The Baby Books". Here is the website link: https://www.beautythroughimperfection.com/actual-milestones/. Thank you.